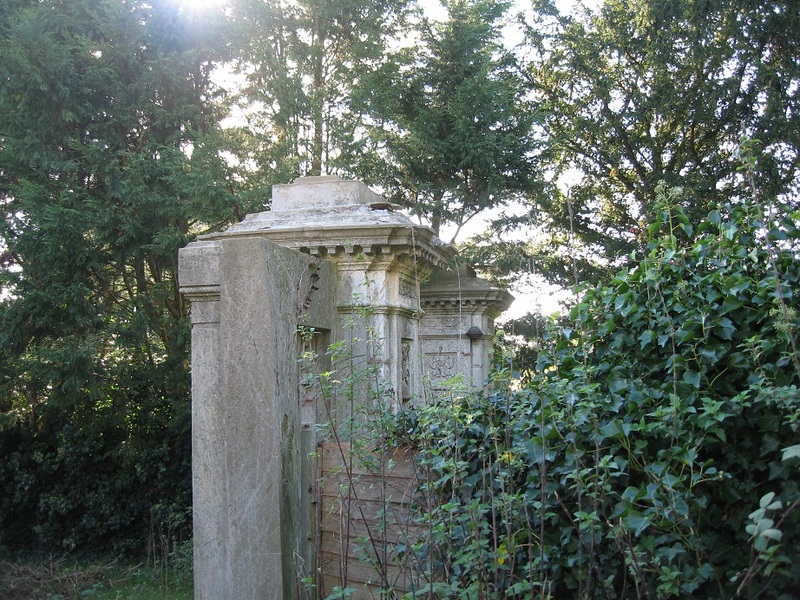 On 1st Feb 1927, part of the southern slopes of the Charmandean estate was sold off by the executors of Thomas Dyer Edwards of Charmandean, to Frank Sandell & Sons, a well known local building firm, for £15,650, who started building and planning First, Second, Third, Fourth and Fifth Avenues. 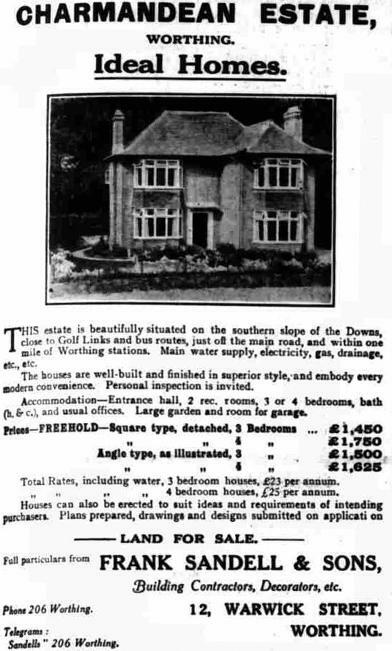 The first section of this article shows articles from the Worthing Gazette and Worthing Herald, advertising the estate and also the houses built. They are in chronological order, and we can see how more different styles were added over time. 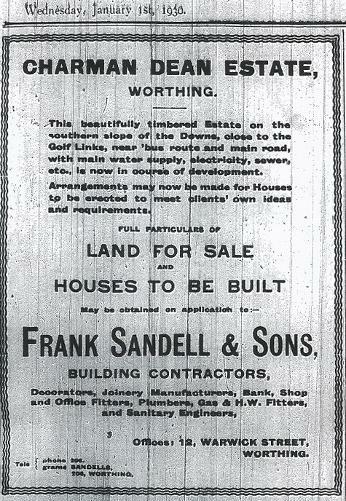 One of the earliest advertisments we have found for development of the estate, in the Worthing Herald from January 1st 1930. Note the spelling of Charman Dean, in the original name when it was Charman (derived from the family name of the owners centuries before) and Dean (olde english for valley), also known as 'charming valley'. At this point, we believe the first few houses had been built, at the southern end of First Avenue, and Sandell & Sons were advertising in the local press. 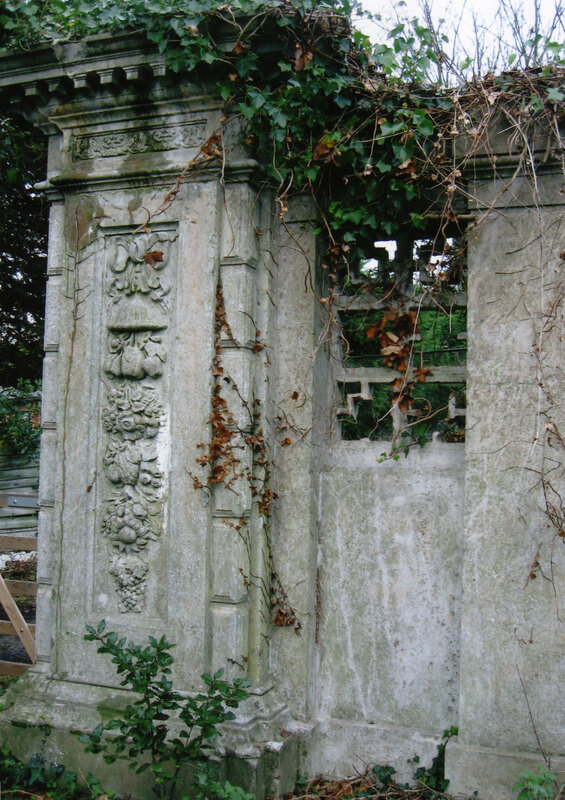 From the location of houses at the time, it is believed not just houses could be built to client's own requirements, but also selection of plot. 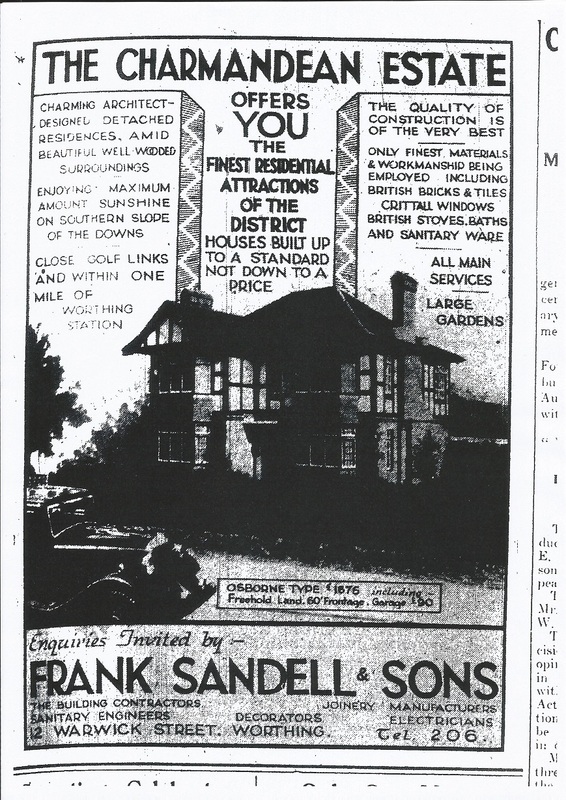 This advert for one of the show homes on the estate in First Avenue ran from at least c.Nov 1930 to c.July 1931. Some of the houses were built to be show homes, and believed to include luxury features such as an en-suite. Despite attempting to obtain copies of the plans, drawings and designs we have only ever found one example. Might any readers have the original plans of their houses? 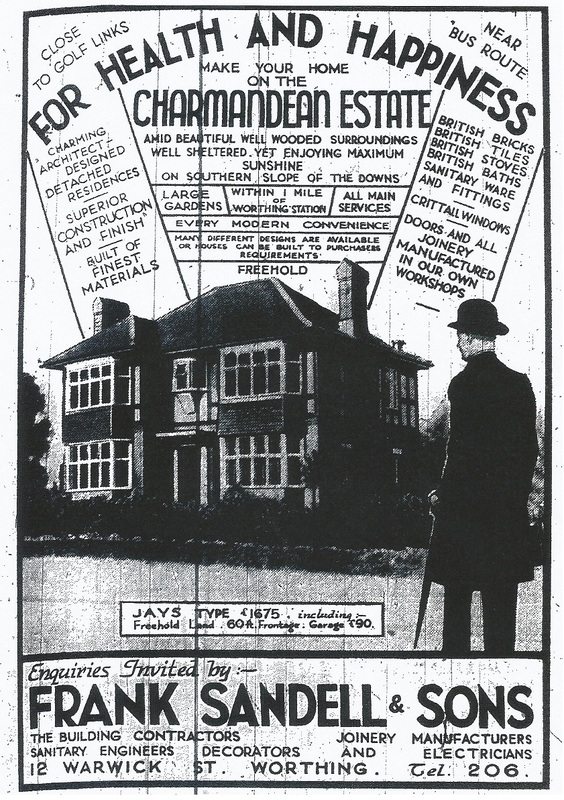 One of the original newspaper adverts from c.1932 advertising the Estate, this one being in First Avenue for the 'Osborne' type house. From the date of the advert, we believe this might have been an advert depicting No. 10 First Avenue. 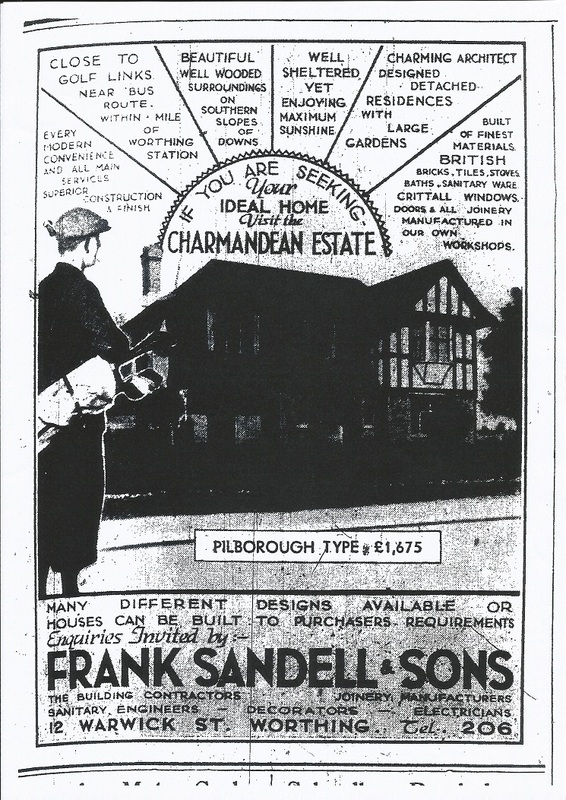 At this point, more choice of designs for building were available and this is shown in later adverts. 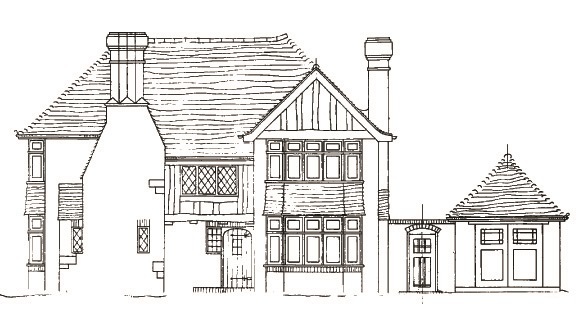 The design and planning of houses which were built on the Estate were designed to reflect and incorporate features of the 'Arts and Crafts' movement, which embraced styles such as 'mock tudor', trying to influence medieval and romantic styles of design. Many of the houses on the estate reflect this and still have features present such as tudor style beams, egg and dart cornicing, panelled ceilings, and stained glass windows, influenced by ideas from architects such as Augustus Pugin, and William Morris. This house on First Avenue is one of the only ones we have found an original blueprint for, and an excellent example of this style of architecture. We are also aware some residents have found architect's drawings for their houses in archives in Chichester. 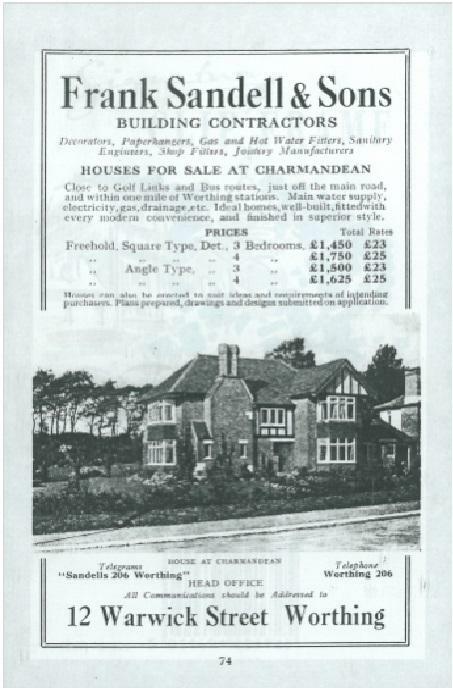 This advert from 1933 shows more the variety of house styles and design which was being offered to the house-buyer at the time. 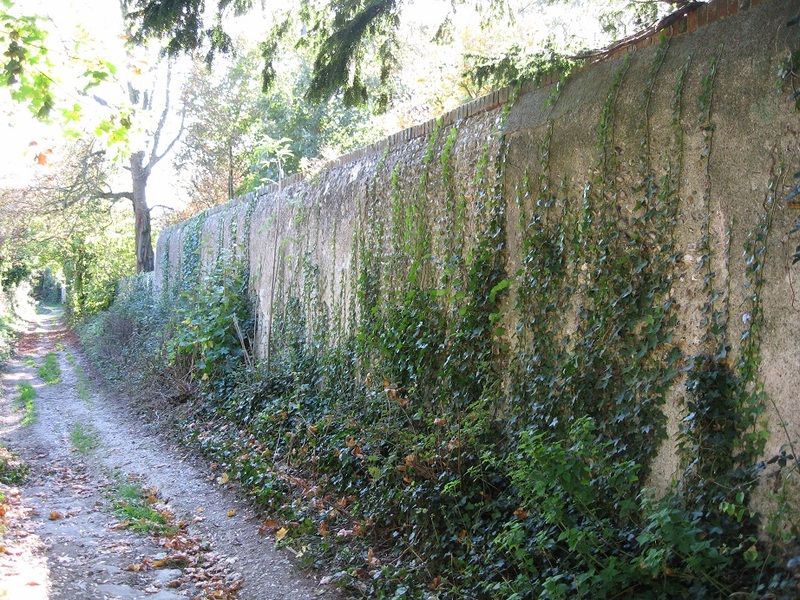 A number of styles seem to be available, with some of the styles re-used between Upper Brighton Road and Second Avenue, for example. There was a difference in price though! 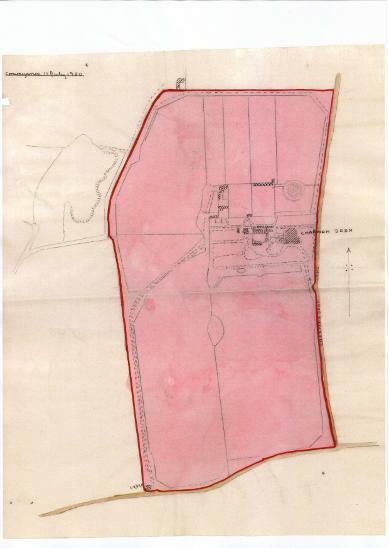 An old map from 1932, showing building starting in the South-Western corner of the Estate. 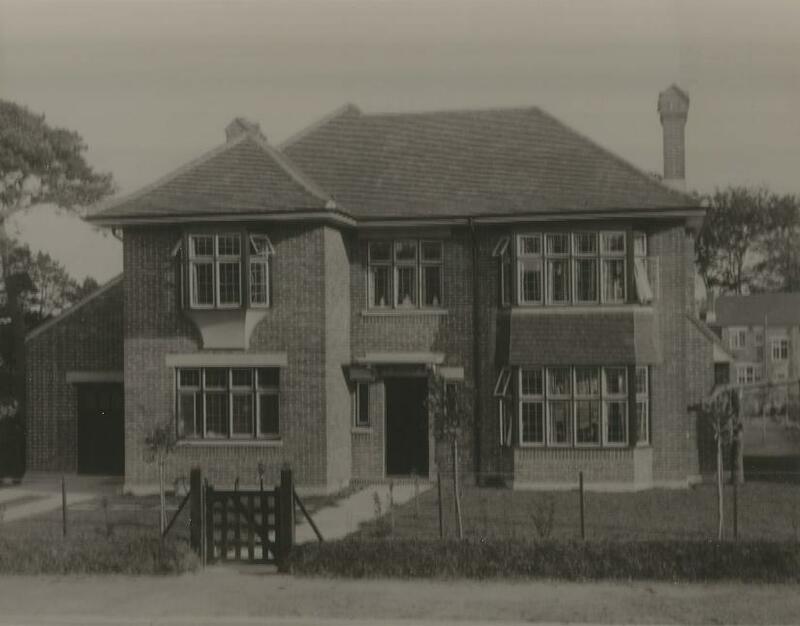 This is interesting as, around this time (c.1933), the house featured on our page 'Building in Charmandean' shows photographs looking out over the Open Space, and with Fourth Avenue plotted out, but no houses built yet. We can see from this map the continuation of the tree line West-East by the now-entrance to Longlands, before First Avenue was extended Northwards. In c.1932, this was the view from the corner of First Avenue and Fourth, looking East across the Open Space, but Fourth Avenue has only been mapped as a road and no houses had been developed yet! On the left side the drive to Charmandean House is just visible, and the trees on the right being in the Open Space - still there today. In c.1936 the building firm who, amongst other firms, were developing the Estate, Frank Sandell & Sons, offered 5 acres of land on the north side of Second Avenue to Worthing Borough Council, 'for use as a public open space so long as football and cricket were banned'. See 'Charmandean Open Space' page for more information. Citation: Worthing Sentinal / Worthing Herald. The house adverts we have seen in the local press were correct, 'Architect Designed residences' - on initial glance it appears some houses are the same, however we believe each one is subtly different, however all the early designs from 1929 follow the same 'Arts and Crafts' style of building design as previously mentioned. Not all came with garages, in 1929 a garage was an extra £90! Left is an advert for one of the houses in Charmandean, which has been kept with the house over the years. (It is the same house as in the blueprints above). Thank you to the owner for contributing this to the site. Square type, 3 or 4 bedrooms, and Angle Type with 3 or 4 bedrooms. The prices were between £1,450 and £1750! A selection of adverts from the Worthing Gazette during 1934 (click to enlarge). An early aerial photo of Charmandean Estate taking shape, post-war, c.1945, with still much of the upper part of First Avenue yet to be developed. The wooded section on the Eastern side of First Avenue, opposite the entrance to Longlands, was not developed at all until the late 1980`s. 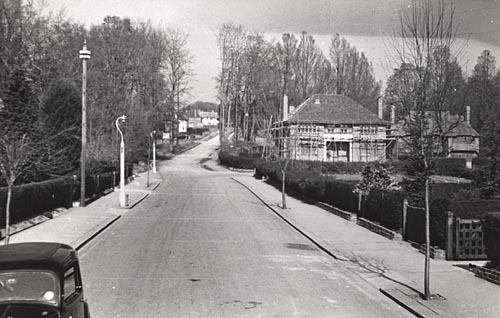 The below photo is from the West Sussex Past Project and c.1944, it is looking North up First Avenue with Fourth Avenue on the right; the house with the scaffolding was owned for many years by Mr Dunhill of special tobacco pipes and luxury goods fame. See famous residents section. We can see where the tree line in the centre of the photo was broken through to continue First Avenue northwards (one can tell from the shape of the trees). 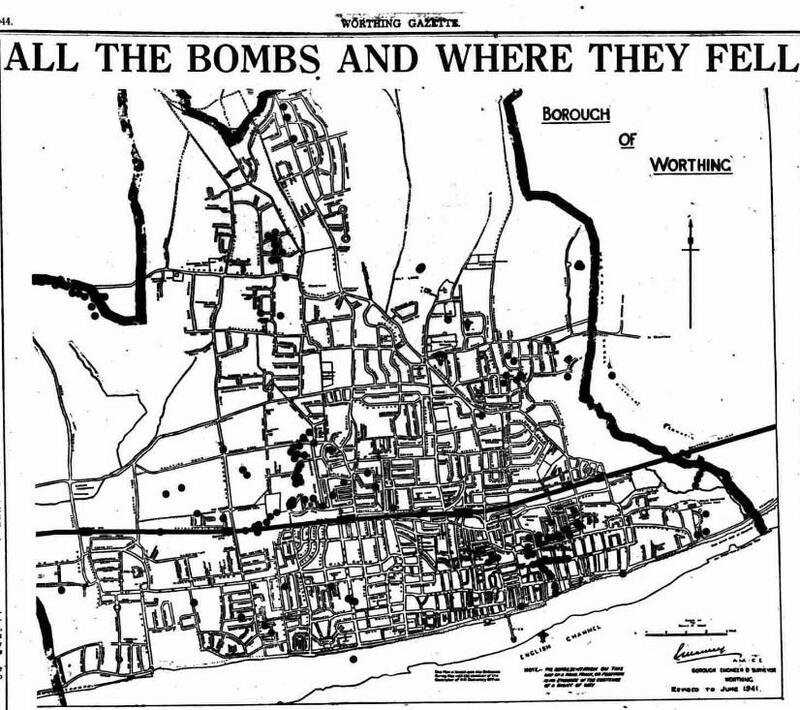 Our research has uncovered a number of individual stories, which we believe could all be related to an incident during the war when a flying bomb landed in the Charmandean Estate (we believe this was the only flying bomb to land on Worthing). Miss R. M. Watts, living in Fourth Avenue in 1942, was the Honorary Secretary of the Worthing Branch of the 'Bible Flower Mission'. It was set up for reasons such as delivering lavender to patients in London hospitals during the war period. Then, their lives changed. At some time in 1944, a German flying bomb landed we believe in the Open Space. Miss Watts in Fourth Avenue was killed in the blast, and many other houses required repairs. 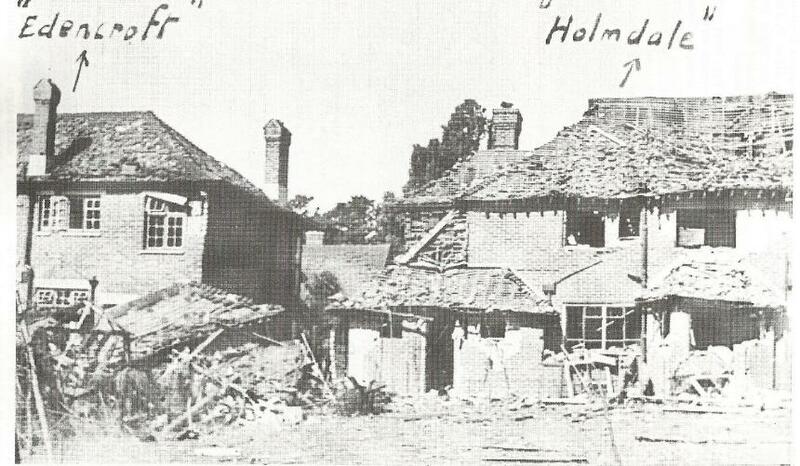 6 houses away on the North side of Fourth Avenue, Mrs Gates had to move out of her bomb-damaged house into temporary accommodation in Railway Approach. 'two 12-inch circular holes believed to be made by unexploded bombs were found on Monday by workmen in a field near the drive leading to Charmandean School, Worthing. Police were informed and arrangements made for a bomb disposal squad to visit the site. 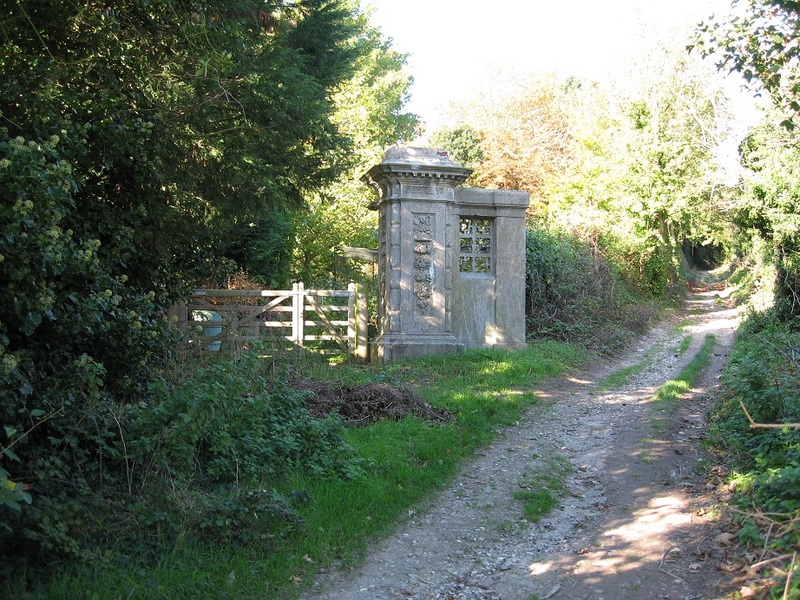 The original West driveway for Charmandean House ran from the Upper Brighton Road, & at the entrance was a lodge mentioned in the 1900 Convenyance map on the right. Thanks to the family of Alfred King, who's great-great niece contacted us and allowed us to share her family's photo album of Charmandean, we now know what the lodge looked like. 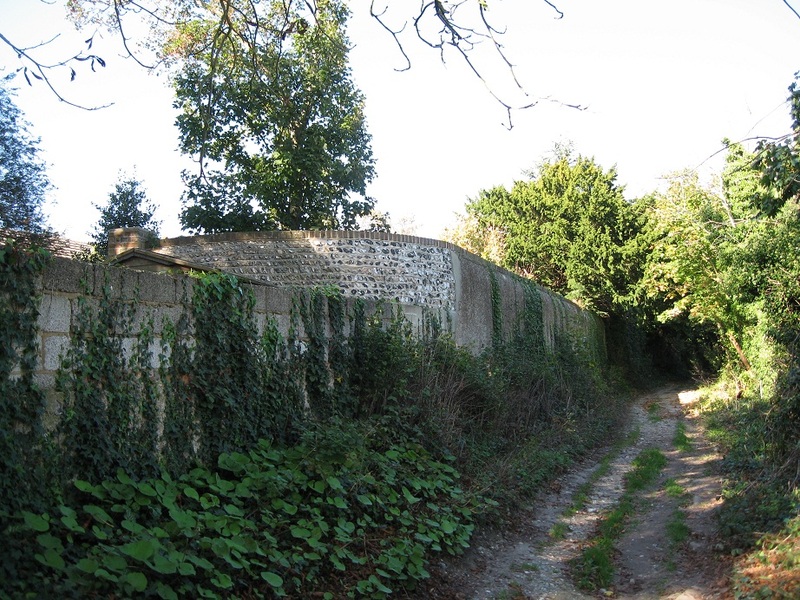 The lodge was demolished during the widening of the A27, and was located in the South-West corner of the estate. 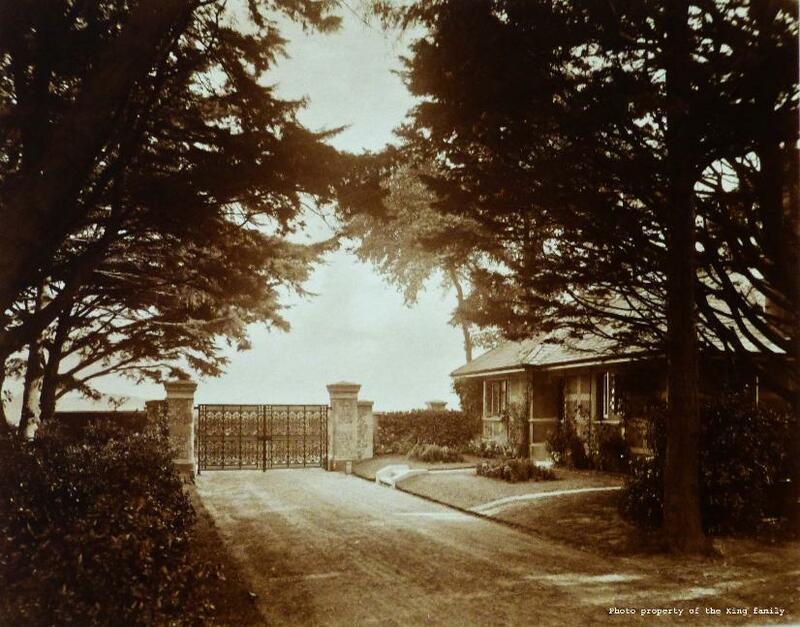 The entrance drive (the West Charmandean entrance) was next to the lodge, and today, would have run South-North in the gardens behind houses in First Avenue. 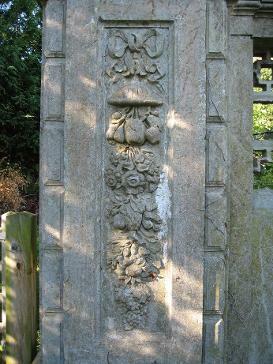 For more information on the Charmandean Gateposts, see Charmandean House page. As this article from the Worthing Gazette, Weds 3rd August 1927 shows, the council wished to widen the A27, and as such, required demolishing of the lodge (and the West Entrance gateposts). 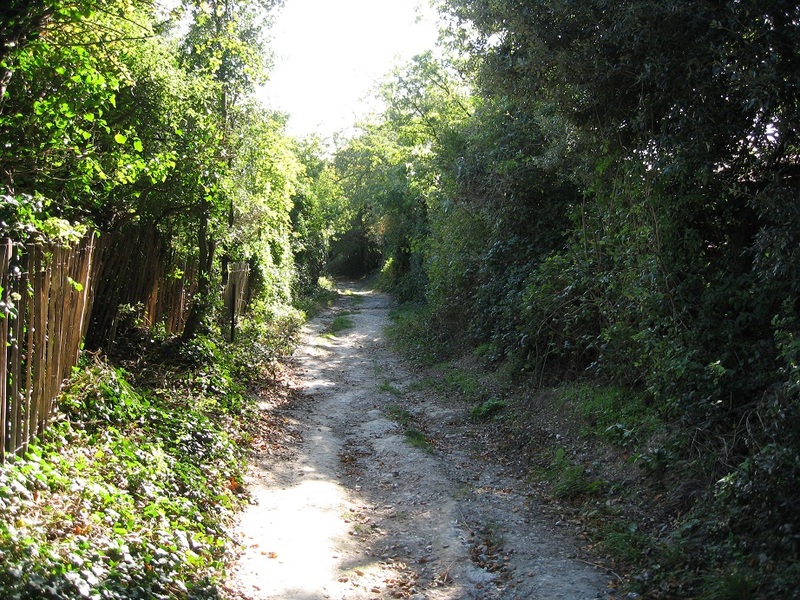 (at this time, the Avenues were not made up as tarmac, and just rough tracks as not adopted by the council). The below article also refers to more detail on the subject. 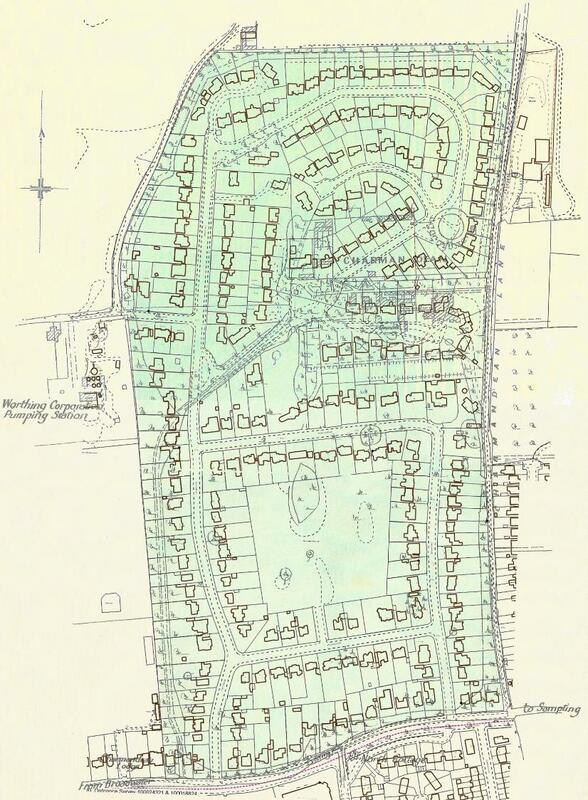 A interesting map from c.1959, showing Upper Brighton Road, partial First, and Second, Third and Fourth Avenues. Longlands had not been built yet (another 4 years) and the East and West Entrances and driveways of Charmandean House are just visible in the top left and right corners. The development of Longlands story can be read in the 'Longlands' pages. In brief... the story reached national headlines, as the Yorkshire Today newspaper reported after Charmandean Residents bought the land to apply strict convenants on it, the land was then sold on to a developer (1963?) for £70,000, with the provisio that it should be developed with 71 3/4 bedroom luxury homes selling for up to £10,000 each. The total cost of the scheme was estimated at just over £500,000! Thank you so much to the resident for allowing us to share this; a house in Second Avenue when built. 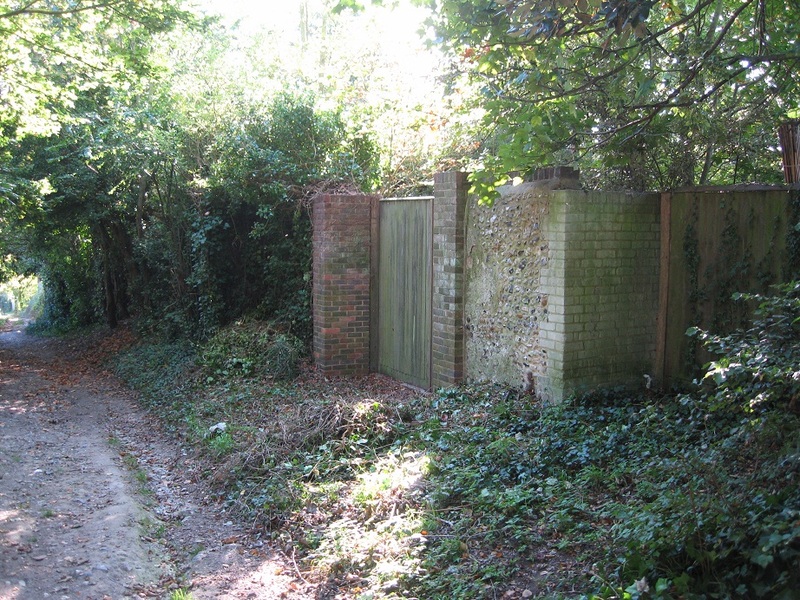 Interesting as you can see the oak gate which many houses seemed to have when built, and the post and wire fences. This is an example of one of the individually designed houses, different from the c.4 designs which were standard as offered by Sandell & Sons during development. Although 'standard' is not strictly true, as we believe each house has subtle differences - there is only one matching pair we are aware of, being the first ones built in First Avenue. 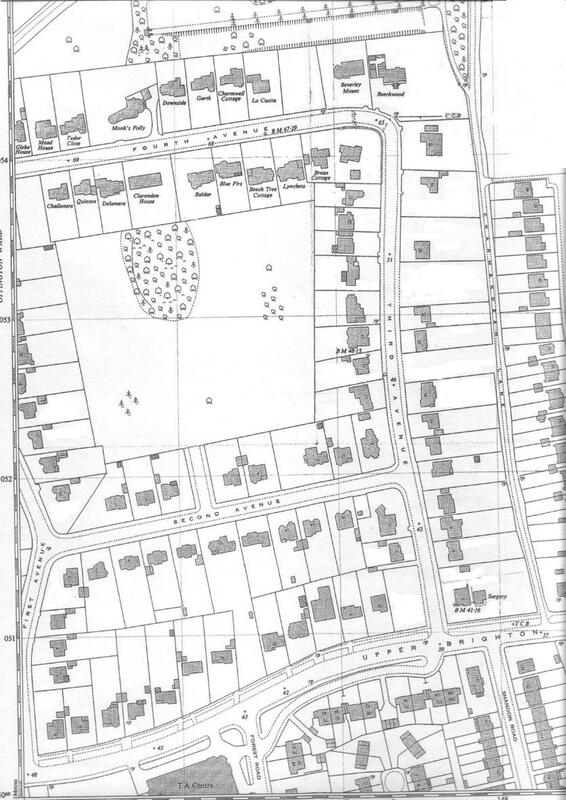 For example.... ever wondered why the houses on the Upper Brighton Road were close to the road on the West, then were set back in from the road in the middle of this map? This overlay shows the reason, being the protected tree line stepping into the Estate. Other items of interest is there was a footpath (or track) marked on some maps from c.1910, running North-South from the old mansion house to the Upper Brighton Road, possibly why the entrance to the Open Space was planned in that position? 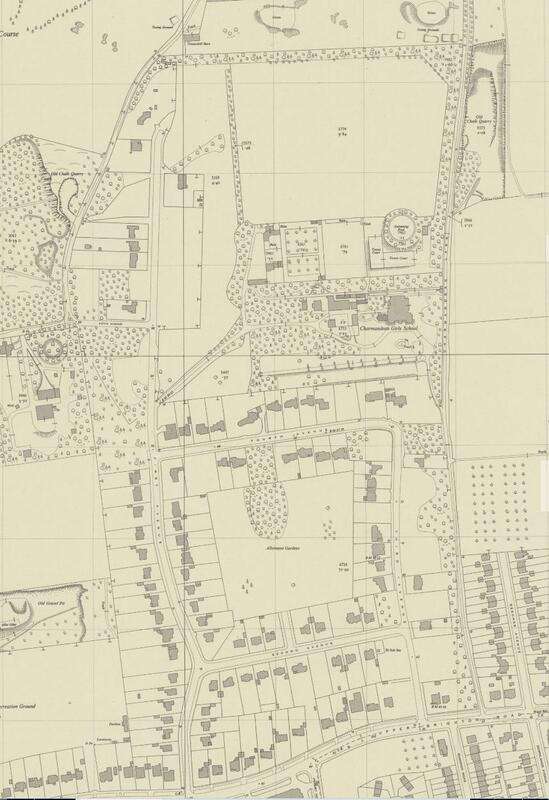 A pair of houses in Fourth Avenue are slightly set back from the building line, possibly to retain the trees marked on this map and still present today? 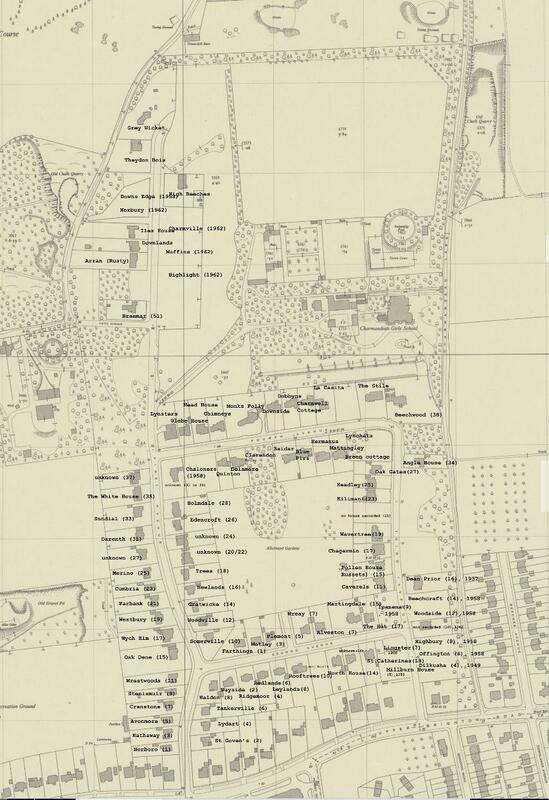 Articles on the location of houses round the swimming pool and fountain are in the 'Development of Longlands' pages. 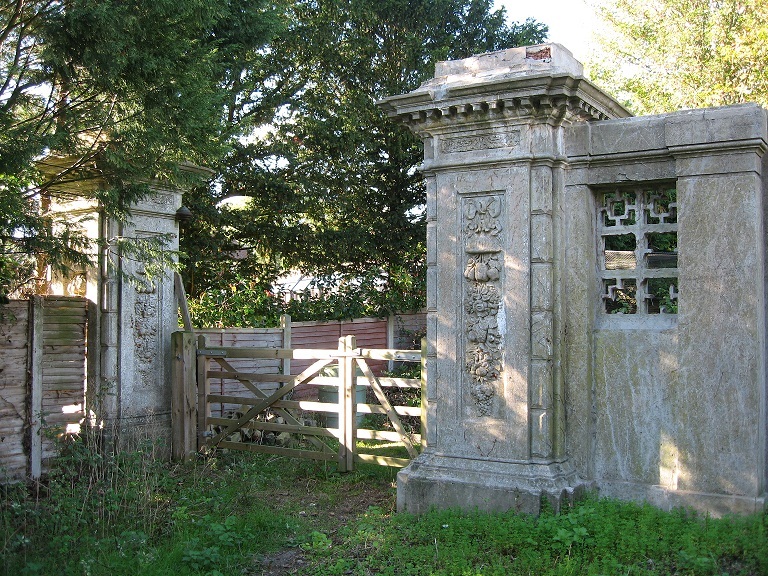 Even after the House was demolished, and Longlands developed, some features remained until recently; in 2013 the original East Entrance gateposts remained until they were demolished. 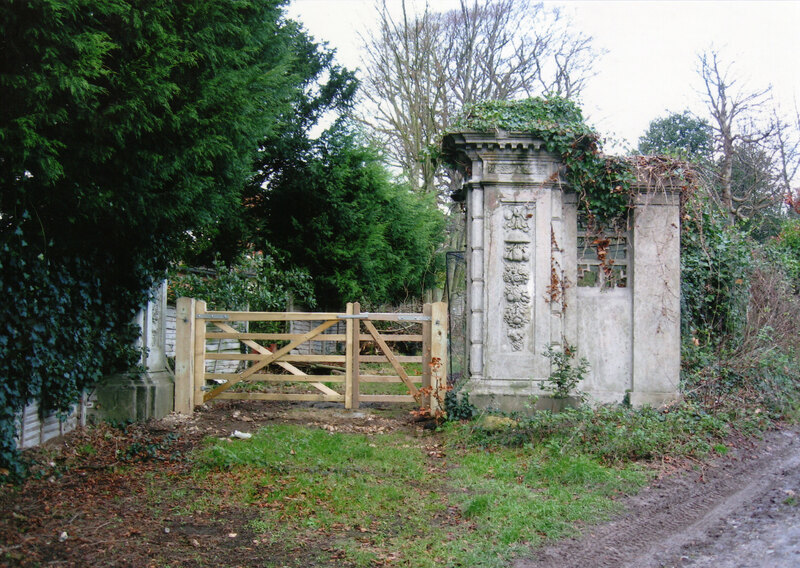 For more information on the Charmandean Gateposts, see Charmandean House page. 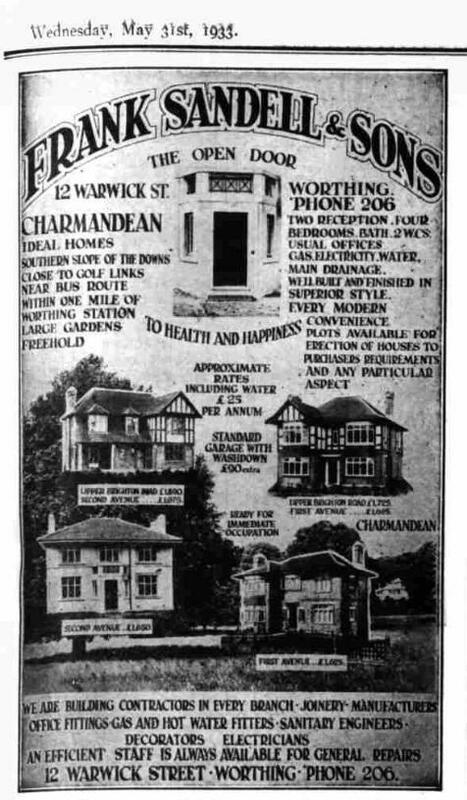 During the development of the lower avenues of Charmandean, in 1937 the builders firm William Sandell & Sons gifted an area of land, known as Charmandean Open Space, to the council for 'relaxation and amenities'. Over the years, there have been a lot of articles on the Open Space, and it hasn`t always been the green recreation area that it is today. We can see from the 1954 OS map, it was marked as 'Allotment space'. If you're a Charmandean Avenues resident, have you ever wondered what the original name your house had? Many of the houses were designed in their facade architecture to have a place to put a house name, such as above the door. We have had enquiries from residents asking such questions. Some readers will remember the days when a road only had house names, and no numbers. It may have been common in those days past, when developers didn`t plan out a whole estate, but purchasers had the option to buy 'per square foot frontage (for example c.£6 per foot frontage as our research has shown). In this case, they couldn`t have planned numbers on a road, hence in the 1930's only house names exist in directories such as 'Kellys Directories' and on maps seen across this site. It is only right we round off this first phase of the development of Charmandean with a fantastic aerial photo, taken by a resident (many thanks to the resident for allowing us to share this). 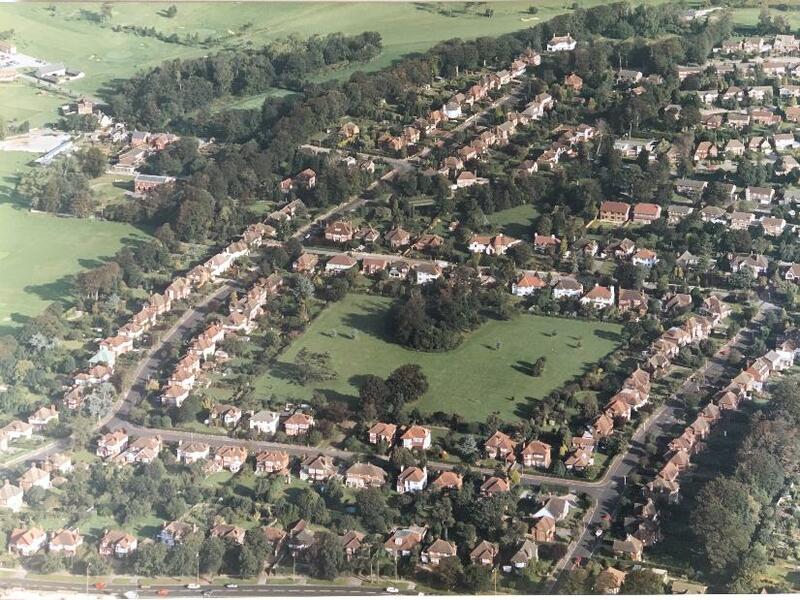 We believe this is c.1989, as the additional 2 houses at the East end of the Spinney are being completed, and the field next to Grey Wicket (top of First) is still present. Interesting for the residents who still remember this!